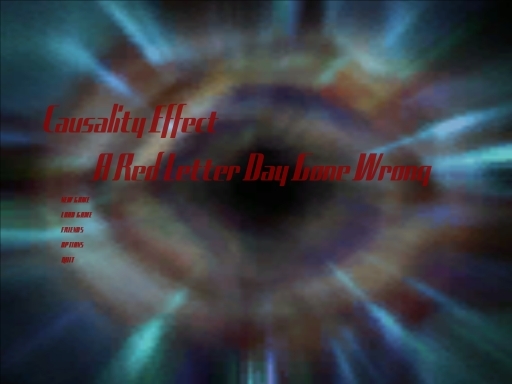 Causality Effect "A Red Letter Day Gone Wrong" is an intriguing spin on the Half-Life 2 story. 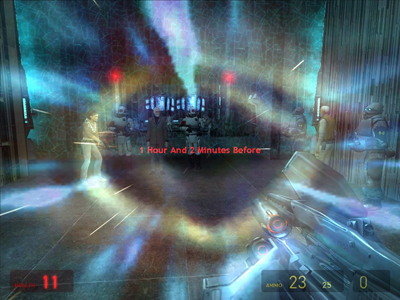 Through the use of the Valve SDK, the developer has been able to add scenes and maps from Half-Life 2 within his mod. Through this method, he has been able to create an alternative scenario to what could of happened to Gordon Freeman when being teleported from Dr. Kleiner's laboratory. As such, you will probably want to play and beat Half-Life 2 to go along with the story being proposed in this mod. Well starting off, the main title screen didn't look all that promising. The background was fairly weak, and the font face and color did not work well either. But, let's not judge a book by it's cover shall we. I found that starting out in this mod (after getting through all the repetitious stuff that was already in Half-Life 2), that this game starts off fairly fast. There was some action and even some challenge early on in the game. Playing through the game is very fast and eventful, including a lot of plot development, and even some interesting twists on the original Half-Life 2 story. Although the ending was challenging (on Hard setting at least), it wasn't too unique of a final fight. Although, supposedly there is four different endings depending on how you fight. The game wasn't totally perfect though. I did experience myself getting stuck sometimes (looking for secrets mostly), and also found my followers getting stuck behind things like headcrab containers. I did also notice some frame rate drops in the sewers map(s). Overall though, this was a really great experience and twist on the original story line.